The training on international human rights system was held 25 - 27 October 2017 at Karaiba Hotel in Banjul, Republic of The Gambia. This meeting aimed to boost the commitment and impact of most African NGOs for a thorough knowledge of the international human rights system as well as the regional system, including the African Commission on Human and Peoples' Rights and its mechanisms. Organized by the African Center foR Democracy and Human Rights Studies in collaboration with the CIVICUS Alliance, the International Service for Human Rights (ISHR), the International Court of Jurists (ICJ), West Africa Regional Office of the United Nations High Commissioner for Human Rights (WARO-UNHCHR), and the Commission of the European Union (EU), participants were equipped with the use of international human rights procedures for advocacy and protection for civil society actors and human rights defenders in Africa. Addressing the Participants, Mr. Andrea Ori, Representative (WARO-UNHCHR) recalled that this meeting comes on the eve of the 30th anniversary of the African Commission on Human and Peoples' Rights (ACHPR). He recalled the obligation to promote and respect human rights, which is the responsibility of States, and that the office is there to sound the alarm when states do not comply with the treaties they have ratified. He also mentioned that in the case of The Gambia and Burkina Faso, Civil Society Organizations have played a key role in changing dictatorial regimes. Ms. Hannah, Director of ACDHRS sent a motion of thanks to all those who contributed to the success of the workshop through their participation, funding and animation. She pointed out that everyone must play the role of activist and speak the language of freedom, peace, democracy, and respect for human rights. Finally, she wished the participants to enjoy the hospitality of The Gambia. From 25 - 27 October 2017, participants in this training presented reports on the state of human rights in their respective countries. One of the facilitators Mr Saranbaatar Bayarmai explained the human rights mechanisms of the United Nations including the Human Rights Council which promotes the respect, protection and promotion of human rights ; the Universal Periodic Examination which is carried out by the peers of Human Rights every 4 years and half; the Special Procedures, which are independent experts appointed by the HRC to monitor the situation on a specific human rights issue in a country; and the Treaty Bodies which are independent expert committees in the field of human rights established by a treaty. Ms. Isatou Harris, Representative of WARO-UNHCHR recalled that the Human Rights Council has assigned gender mainstreaming mandates, which are to specify a systematic gender mainstreaming in the implementation of mandates, a qualitative and quantitative analysis of women's rights in reporting and a primary consideration of gender balance in appointments. 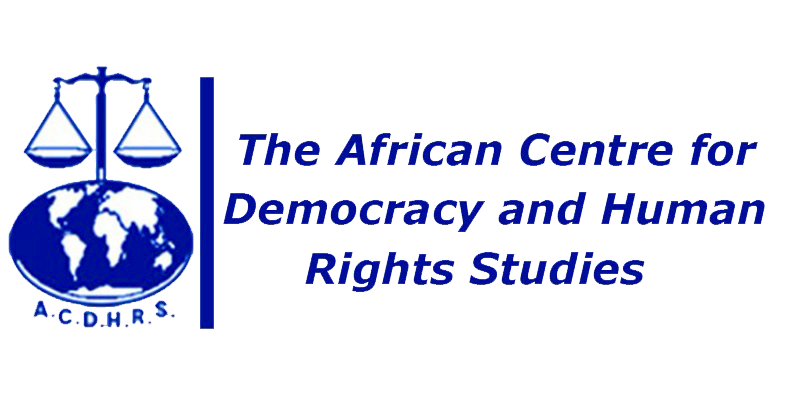 The African Center for Democracy and Human Rights Studies (ACDHRS) since its creation has been at the forefront of the promotion and protection of human rights on the continent through training, capacity building, research, advocacy, networking, among others.